It is far too easy to treat the day as just another holiday. Spring’s long weekend. The traditional date that signals the start of summer. A sign that school is about to let out. I am guilty on all accounts. Not having family members who were lost in our country’s wars, I have no personal remembrances to honor. By all appearances, this Memorial Day would follow suit. It was cabin opening weekend, and I alternated play with spring chores at our treasured retreat on the lake. For Memorial Day, Rich and I planned an early morning bike ride. Up before dawn, we were treated to a beautiful red sunrise reflecting in the calm waters of the lake. It was still shady and cool when we started our ride, with high hopes that the early hour would yield some wildlife sightings (me) or birds (Rich). We saw neither but were privy to the woods awakening, streams calmly wandering and copious bird chatter. 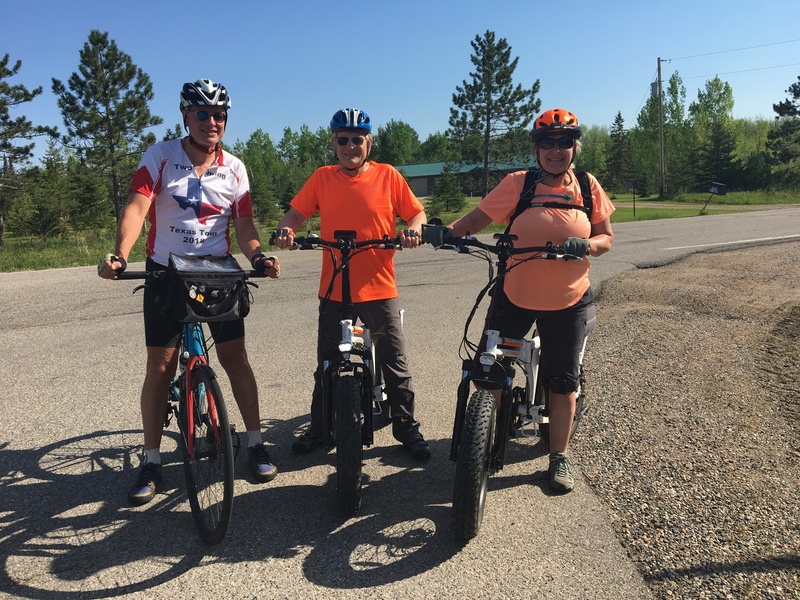 A rendezvous with friends at the Effie Cafe for breakfast allowed us to catch up, share some camaraderie, and to investigate their new e-bikes. Whittling down the miles back to our car, we spotted a congregation of cars parked up ahead on the quiet farm road. 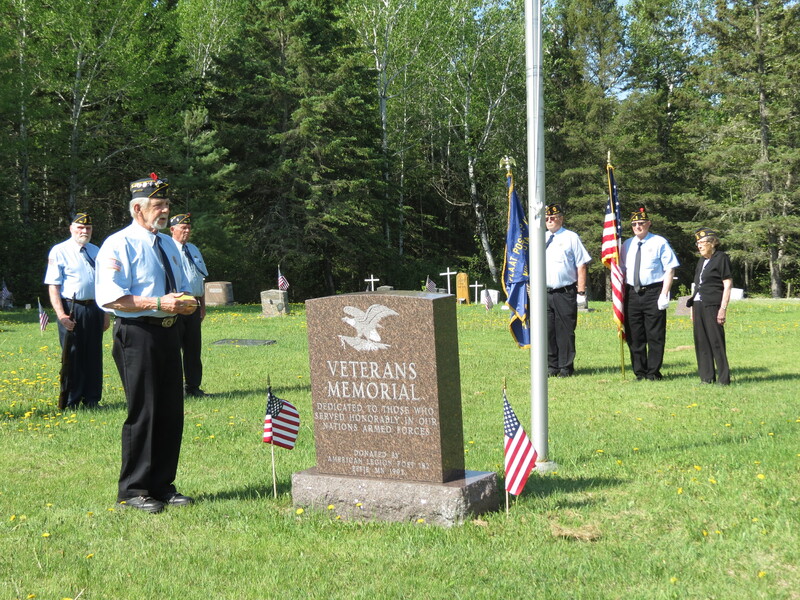 At Fredheim Lutheran Church, American Legion members from Effie along with family and community members were gathered for a Memorial Day service. In the warm summer air and sunshine, we passed by. Then thought, why not? Returning to the site, we parked our bikes and were heartily welcomed by the assembled folk. 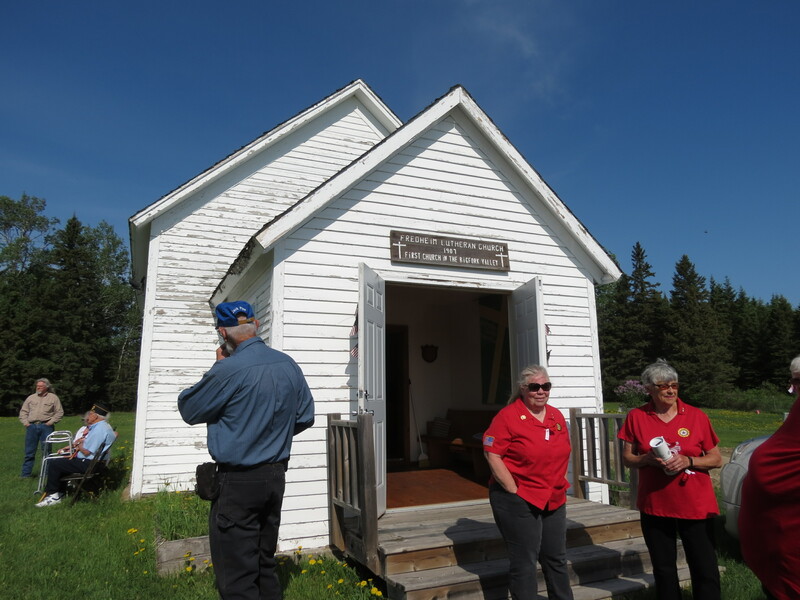 The 1907 church – the first in the Bigfork Valley – felt like a most appropriate backdrop for this occasion. “See the woman with the color guard?” a bystander asked. “She’s 95 and served in the Marines.” I looked on with awe. “She’s still the organist at our church.” I was humbled. 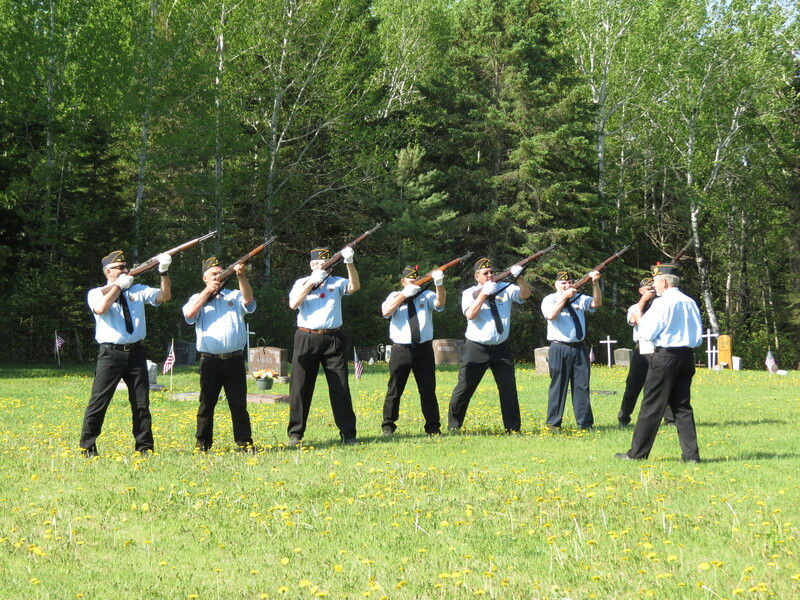 Seven men in uniform lined up with their rifles. Amidst instructions from their leader and some good natured banter they practiced their moves. What they lacked in precision they more than made up in earnestness. The ceremony was short, to the point and moving. From the Pledge of Allegiance to the strains of the National Anthem, it was the intimacy of the gathering that made it poignant. The message delivered by one of the veterans was simple yet brought the message home. He challenged one and all to live our beliefs, starting that very day. As the final shots of the 21 gun salute echoed into silence, I couldn’t help but think long and hard about the names that were read and what they had sacrificed. I felt grateful for what they had given for our freedom. And thankful that we had stumbled on this ceremony. It wasn’t just another holiday after all. It was a most fitting Memorial Day. For a change. This entry was posted in Life Up North and tagged Cycling, Holidays by Molly. Bookmark the permalink. Memorial day across the State is a special occasion. glad you could participate. It hit 100 here today. Sweltering to say the least.